European cities are lighting up! 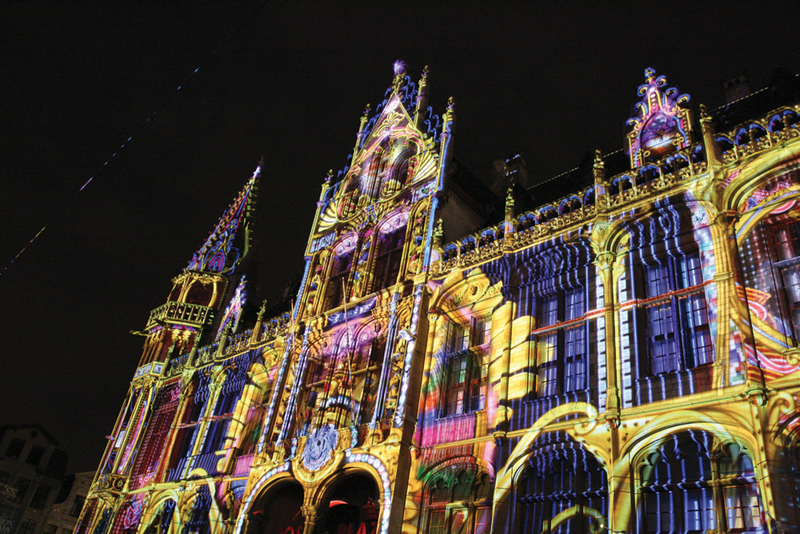 3D Projection Mapping, or Urban Projection Mapping, seems to be becoming more popular every year. It’s basically a motion graphics technique that involves taking footage of a building’s facade, editing the clip in post-production with special effects and projecting the edited footage directly onto its original source. Only really beginning in the early 2000s for the use in music concerts (Gorillaz and Madonna at the 2007 European MTV Awards), the technique has become popular for advertisements and art shows across the world. Advertisers have become well aware of the urban projection mapping trend, having hired video artists to present their wares to the world (see Amsterdam H&M store opening right). It’s also taken off as a place marketing tool for cities to show off their greatest buildings and landmarks, as well as a campaign mechanism to convey particular messages. The Festival of Lights in Ghent, Belgium, uses the display to achieve both of these things... Low level LED lights to illustrate how energy savings can be made, and the 5 kilometre walking light tour of the city also acts to show off some of its most beautiful buildings and monuments. By far the biggest attraction of the event, The LED Cathedral mixes Romanesque and Renaissance architecture with glowing rainbow ornamentation. It stands 91 feet tall at its peak and is made of 55,000 LED lights. With funding coming from both city councils and private enterprise, this trend seems to be taking off across the continent. With so many cool possibilities for more interactive/fun/interesting cities, the rise of 3D Projection Mapping also raises some interesting questions about advertising in public spaces and the role of governments in managing what is essentially just, well, light. Just because it can't be 'touched', does that make it a non-invasive means of advertising? While I love the idea of a little more colour ad interactivity in the city, I'm not too keen on being bombarded with advertisements everywhere I go! None-the-less it'll be fascinating to see how light festivals and urban projection mapping techniques are utilised in the future. In the mean time, light shows are a great way to enjoy a beer and explore a city, so be sure to check one out!